At last! 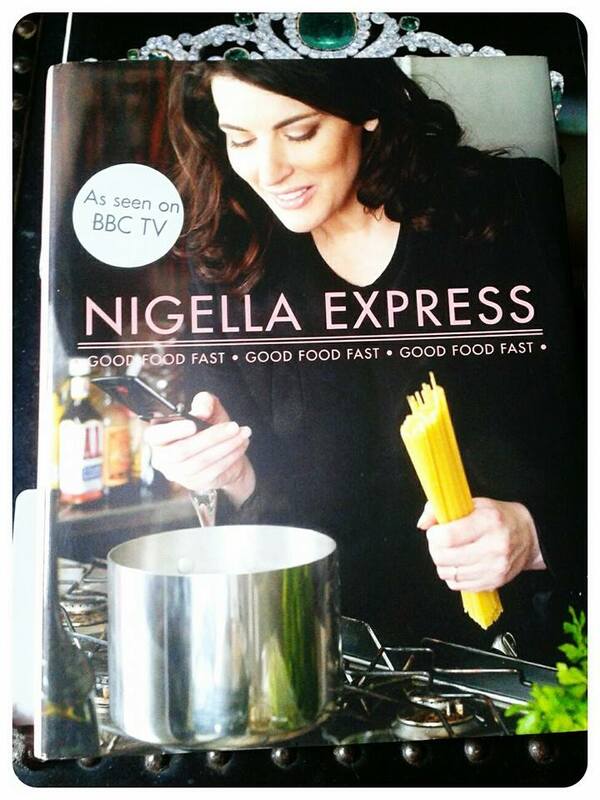 I plucked up the courage to delve into Nigella. So to speak. I’ve had the book for ages, and I remember it being on TV a couple of years’ ago, and we joked how we never had any stale croissants left in the cupboard, and should we try to caramelise them after a night out we’d probably burn the house down (Caramel Croissant Pudding, page 23) – and all these years later, I probably still would. I’d made a tuna-beany salad from it years’ ago, and it was really nice; but never made anything hot. I’ll admit, it was a bit of a special occasion – my friend was coming to stay and she says I can’t cook… so like a mature adult (that I am), I used Nigella as a weapon. Biff, take that for can’t cook! I think I was always put off making the hot recipes by the received horror of tracking down the ingredients for a Nigella recipe. I’ve sat through many a boxing day dinner listening to a family friend’s story about getting the last star anise in the whole of Nottinghamshire, dishing out black eyes in the process – especially to do something festive with it on Nigella’s say so. I must say, it wasn’t as hard as I thought it would be. 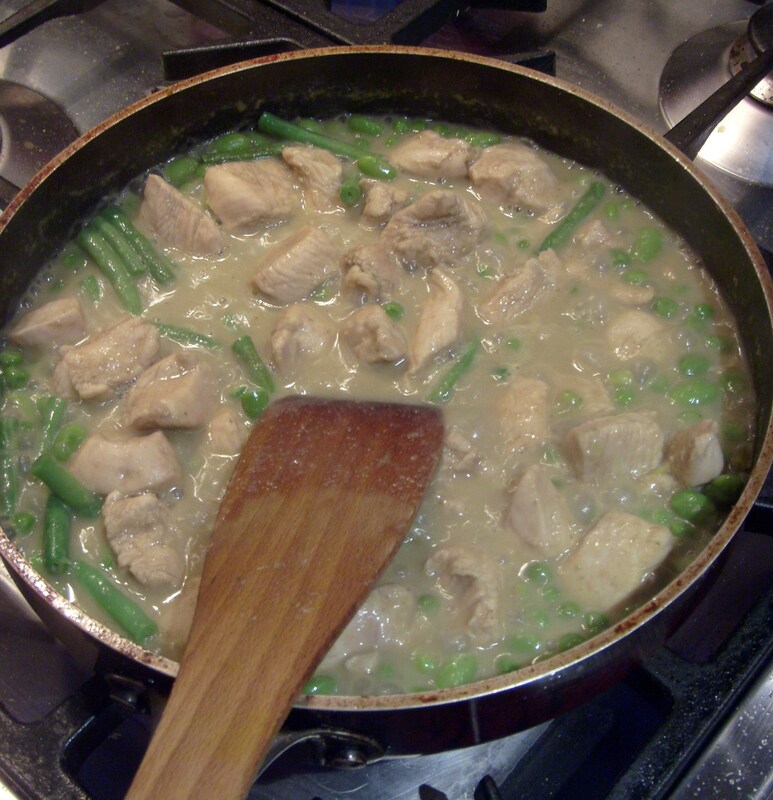 I’m lucky there is a good Thai Supermarket down the street, and the butcher is a whizz with chicken; however I had a bit of trouble with the soya beans. I wasn’t sure what a soya bean was, and I wasn’t entirely sure where to get them from – so I went to a health food shop. They had dried ones, which I would have to boil and simmer for hours but no fresh. Then I went to Whole Foods in Kensington, and they had the dried ones, but the shopboy said they had no fresh or frozen. They had frozen edamame beans (which google said were the same thing), but only in massive bags. Yay for Brook Green Tesco’s though, they sold frozen soya beans in bags small enough for my tiny little ice compartment, my Nigella ingredients finding mission over for this week. I reckon you can get hold of Green Thai Curry Paste and Nam Pla fish sauce in most larger supermarkets, but if you live near an ‘oriental supermarket’ you’d be better off going there. 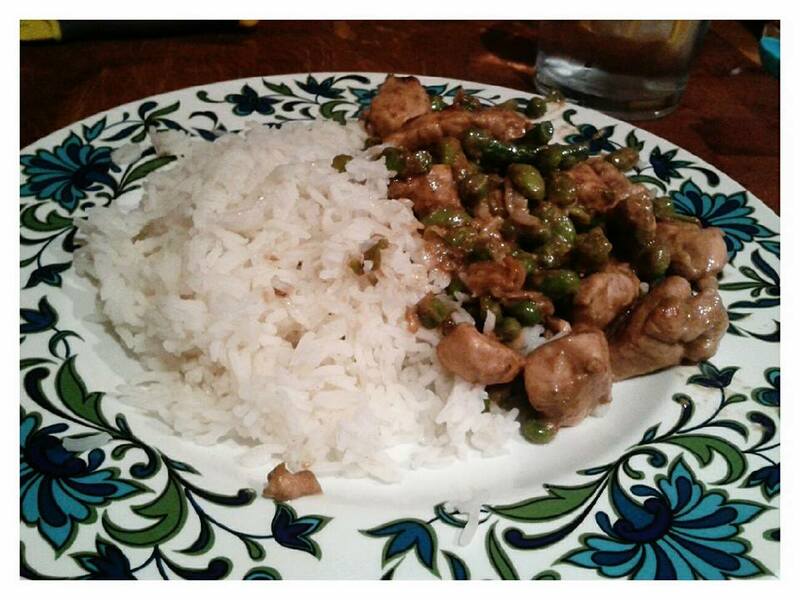 I “accidentally” went to the pub and got a little ginny before making this the first time, and I had to substitute a beef stock cube for the required chicken one, but it was lovely. Genuinely lovely. There was an awkward moment where it looked like a pan full of sick, but the water boiled down to a nice thick sauce and we didn’t have to order pizza. I have made this a few times now, but still not made it with the quantities below – I have found that half quantities will serve 4 easily, and it freezes well . To serve 6 you will need: wok oil, 3 tablespoons finely chopped spring onions (although I usually leave them pretty chunky out of laziness) 3 or 4 tablespoons of Green Thai Curry Paste, 1 kg chicken thigh fillets (When I make half the quantity I use two breasts) 1 can of coconut milk, chicken stock (250ml of boiling water with enough stock for 500ml), 1 tablespoon fish sauce (nam pla), 185g frozen peas, 200g frozen soya beans, 150g frozen fine beans (I use fresh ones) and 3 tablespoons of fresh chopped coriander, which I always forget. Heat the 2tbs of wok oil in a large lidded saucepan (although I’ve made this a load of times and can’t work out which bit I’m supposed to put the lid on for) and throw in the spring onions, cook them for a couple of minutes and add the curry paste. Cook for another 3 to 5 minutes and serve. Nigella recommends serving with rice or noodles – I’ve not tried with noodles but its delicious on a baked potato. Bravo Nigella – I’m not scared anymore!